We are currently adding a studio to it. 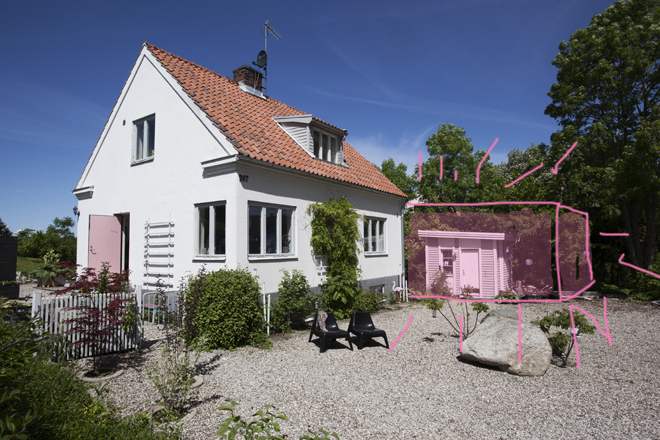 (marked in pink in the picture above) It will be quite big with room for my photography and Jens illustrating/3D and graphics business. It has taken years to get this approved. The paper work here in Sweden regarding an addition like this is quite comprehensive and takes a lot of time and energy. Anyway now we are finally building it. Hopefully we will be ready to move in after Christmas. Jens and I will split the space up in two sections. One for me and one for him. As you can see on the sketch we will be able to reach the studio from our house (right through Australia as a matter a fact) and also through an entrance from the street. As you know, Jens and I have both been working from home since we moved here 7 years ago and sure it´s been nice but also very messy and sometimes chaotic . Here is what our working situation is like at the moment. And we´ve used diffrent places for me to set up a studio usually in our living room. I´m currently shooting a catalog in my sisters garage and I´ve used my fathers often. Like here! The construction is made in wood. All windows and doors are bought second hand via Blocket. I´ll tell you more about it soon. Jenny´s house on the inside! åh det kommer bli så great! it looks great! what an amazing space to get! Ah, det ser toppen ut! Tänk vilka underbara bilder vi kommer att få se. Studio för pyssel står högt på min egen önskelista.